When the original Acura NSX made its debut 25 years ago, it forever changed the supercar universe by combining scintillating sports car styling and athletic performance—common traits long associated with the exotic car segment—with a new dimension of quality, exceptional ergonomics, comfort, and dynamic poise. The NSX introduced and defined Acura’s approach to “Precision Crafted Performance” with its cutting-edge design and innovative technology that provided accessible supercar performance for real drivers in the real world. By making use of advanced new technologies such as a lightweight yet rigid all-aluminum monocoque body/chassis and a mid-mounted transverse V6, the original NSX challenged the conventional wisdom for a supercar. Its high-revving V6 engine featured a number of innovative production car technologies including forged pistons, titanium connecting rods and VTEC valve train. Moreover, the NSX sought a more intimate connection between the car, the driver and the road underneath them, pursued through essential design elements – light weight, open and airy cockpit, and excellent ergonomics – creating an altogether new and paradigm-challenging definition of supercar performance. Seriously…who cares on this one. The overarching concept for the design and development of this next-generation 2017 Acura NSX was the idea of a “human-centered supercar,” one that places the driver at the center of its mission in each and every element of its design and dynamic performance. Respecting the foundational concepts of the original NSX—accessible supercar performance, everyday drivability, and openness to new technology—this next-generation NSX pursues an altogether new and revolutionary concept of Acura supercar performance – melding timeless NSX values with advanced technologies to create a New Sports eXperience. Advanced Sports Package – optimizing the design and packaging in all the above aspects—the human package, the body, and finally the key components of the power unit to lower and center the mass of the vehicle. With these fundamentals in place, NSX engineers could effectively develop technical solutions needed to deliver the New Sports driving experience they sought. To fully realize this New Sports eXperience, Acura electrifies the advanced fundamentals by leveraging its longstanding Direct Yaw Control knowhow through its Sport Hybrid Super Handling All-Wheel-Drive (SH-AWD) system, the first of its kind in the supercar realm. 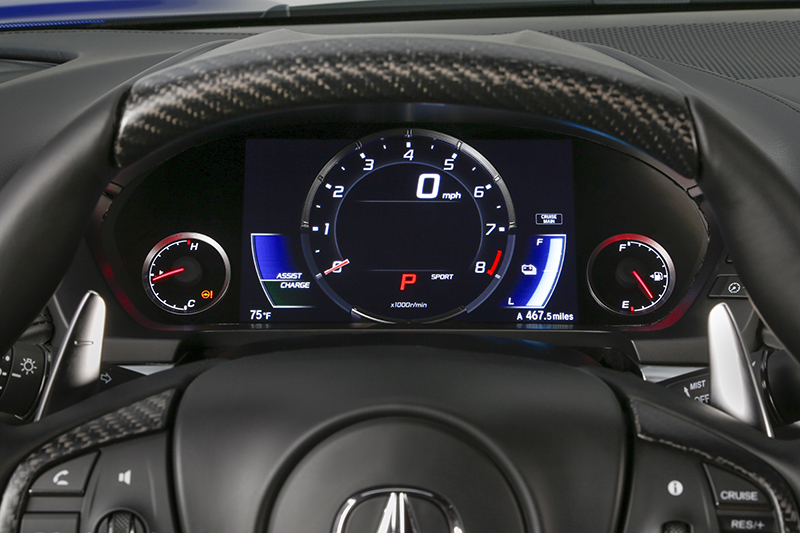 The NSX concept for “zero delay” is more than acceleration, actually involving every aspect of the driver interface … the capacity to directly respond to the driver’s demands in all three phases of driving: Go, Stop, Turn (acceleration, braking and cornering). The NSX’s advanced power unit supports this achievement. 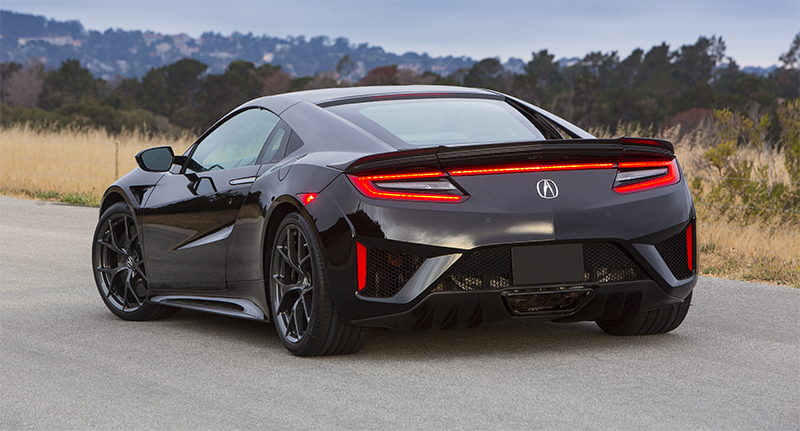 Zero delay acceleration and active AWD traction power the NSX out of corners. Energy recovery supports direct and linear braking. And power strategically applied to the wheels directly creates a yaw moment to help turn the car according to the driver’s will. Marrying new approaches to vehicle design fundamentals, including advanced body construction, component packaging and aerodynamic optimization, with an advanced and electrified new expression of Acura’s direct yaw control concept results in a supercar that faithfully translates the inputs of the driver with incredible fidelity and zero delay while minimizing the driver’s workload—qualities that define the New Sports eXperience. Development of the next-generation NSX involved a global team of engineers and designers, with development of the Sport Hybrid power unit centered in Tochigi, Japan. Development of the body, chassis, electrical, interior and other vehicle technologies including total system integration, was concentrated in Raymond, Ohio. Initial styling design for the NSX was conducted at the company’s Wako design studio in Japan, and was evolved for production by the Acura Design Studio in Los Angeles. Throughout its roughly four-year development, the fundamental “human-centered supercar” concept for the next-generation NSX remained clear and consistent. However, the technologies and means by which the R&D team would realize their concept underwent a process of continual improvement and evolution, most notably in the area of engine design. Whereas the original direction called for a transverse-mounted, normally aspirated V6, the NSX development concept evolved to a new and more challenging approach: an all-new bespoke twin-turbocharged, longitudinally mounted V6. This radical re-imagination of the engine design had profound implications for every element of the NSX design—the package, cooling, aerodynamics, chassis and more. The NSX has been tested and tuned on streets and race circuits around the world. Primary development was conducted at the Transportation Research Center adjacent to Honda R&D Americas Ohio Center as well as the Honda Takasu proving ground in northern Japan before moving to tracks such as Virginia International Raceway and the famed Nürburgring, followed by global “genteki” events (“at-the-spot” verification) which took NSX on public roads throughout the U.S. and Europe and beyond. Construction of the NSX will take place at the new Performance Manufacturing Center (PMC) in Marysville, Ohio. The PMC was designed to innovate both the means and the methods of producing low-volume specialty cars and to realize challenging new ideas for next-generation craftsmanship and quality established by the NSX manufacturing team. The PMC employs approximately 100 associates, including 70 highly skilled manufacturing technicians engaged in body construction, painting, assembly and quality confirmation of the NSX. Among its many innovative processes is the use of robotic MIG welding for the construction of the NSX’s aluminum space frame. The NSX’s bespoke twin-turbocharged V6 engine is assembled by master engine builders at the company’s engine plant in Anna, Ohio. The engine is broken in on a dyno so that it’s track-ready when it leaves the factory. Then it’s mated to a direct drive motor (part of the hybrid system) and precision balanced as an assembly. Its bespoke 9-speed dual clutch transmission is then attached to the engine and this portion of the total power unit is sent to the PMC. The Twin Motor Unit (TMU) and other hybrid system components are built in Japan and shipped to Ohio for final assembly, completing the overall power unit. Total Airflow Management – a new airflow management approach gives the NSX the superlative airflow management expected of a next-generation supercar, cooling is ducted through heat exchangers and then precisely directed to various exit locations to optimize drag and downforce. 2017 Acura NSX – Sport Mode. Like the original Acura NSX—the world’s first all-aluminum supercar—the all-new NSX has a cutting-edge structure: its Multi-Material body, utilizes new materials and construction methods to create a platform with unprecedented dynamic rigidity. From its minimalistic yet contemporary design to its careful application of materials in the seat and steering wheel the team sought to support the driver and clarify the driving experience. The interior of the all-new Acura NSX has a “human-centric” ergonomically-enhanced design theme for both the driver and passenger. Since steering feel and performance are such an important aspect of the on-rails handling nature of the high-performance NSX, unusually detailed attention was paid to perfecting the steering wheel. This included maximizing grip via a more ergonomic shape and increasing surface contact for the hands, as well as easier operation of the paddle shifters. To maximize forward visibility, specially designed A-pillars made of ultra-high-strength steel were incorporated into the design of the all-new Acura NSX. These new pillars are actually a full inch thinner than those of the original NSX, but offer enhanced safety performance. The new Acura NSX Advanced Sports Package is a design philosophy that seeks to optimize the design and packaging of all major vehicle systems—the body, chassis and interior, including the mid-mounted Sport Hybrid Power Unit (engine, Direct Drive Motor and 9DCT) and key hybrid components including the Intelligent Power Unit (containing the lithium-ion battery pack), PDU and the TMU—to lower and center the mass of the vehicle for optimal handling and dynamic response. While maintaining ground clearance similar to the highest volume sports car and expanding the head room to accommodate a 95th percentile American male, the new NSX has the lowest center of gravity among its core competitors. “In many ways, with the design of the all-new Acura NSX, you literally have form following function, so this was a really exciting vehicle to work on as an aerodynamicist,” says Thomas Ramsay, the Aerodynamics and Cooling Project Leader on the new Acura supercar. NSX’s body shape was effectively designed to minimize aerodynamic drag while creating balanced front-to-rear downforce through a total airflow management focus on utilizing airflow through each vent, while extracting maximum energy from the airflow field to cool the brakes and manage power unit thermal loads. Through extensive research and development, the NSX aerodynamics team determined that placing approximately three times as much downforce at the rear of the vehicle relative to the front of the car would provide the optimal downforce balance for high-performance driving as well as everyday functionality. Further evidence of the superior aerodynamics engineered into the NSX is that its high level of downforce is accomplished without the need for active aerodynamic bodywork or other devices. When accelerating, the system provides instantaneous torque via its three electric motors—the rear direct drive motor and front Twin Motor Unit—that is maximized at all four tires when accelerating or powering out of corners. When trail-braking into a corner, the system utilizes the front TMU for enhanced deceleration—the advanced braking system works in concert with the vehicle’s mechanical brakes to precisely decelerate, and the Direct Yaw Control delivers precise and immediate turn-in performance while allowing drivers to point their eyes toward the corner apexes. When exiting a corner, the driver can pick up the throttle earlier and with more confidence and accelerate with added precision and as well as reduced workload. By taking advantage of the immediate torque response of the system’s three electric motors to heighten the control and effectiveness of direct yaw control, the Acura NSX Sport Hybrid SH AWD system elevates any driver’s confidence and performance driving capabilities while extracting more performance from the car. The exceptional dynamic capabilities and zero-delay responses of the new NSX are enabled by the exploitation of advanced powertrain technologies. This concept of utilizing next-generation technology to deliver a New Sports eXperience is epitomized by the adoption of a Sport Hybrid power unit. At the heart of this new hybrid power unit is a bespoke, mid-mounted twin-turbocharged, 75-degree 3.5-liter DOHC V6 engine with dry sump lubrication, mated to an all-new 9-speed dual clutch transmission (9DCT) and Direct-Drive Motor. This is augmented by the front Twin Motor Unit (TMU) driving the front wheels. The NSX Sport Hybrid power unit offers exceptional horsepower and torque with a broad powerband for tremendous throttle response and acceleration. Total system peak output is estimated at 573 horsepower—500 horsepower from the gasoline engine and 73 horsepower from the front TMU. Featuring a wide V-angle of 75 degrees to help lower the center of gravity, the NSX’s twin-turbocharged V6 engine achieves the best balance between power production, overall compactness and reduced mass. With a displacement of 3.5 liters, it combines both direct injection and port injection, along with Variable Timing Control (VTC) to deliver optimal camshaft phasing, for precision combustion control throughout the entire rpm band while simultaneously achieving high power output and performance at high engine speeds. Making use of an electronic wastegate for each turbocharger for faster response as well as more precisely varying vane positioning, the single-scroll turbocharger design allows for the use of smaller turbos to reduce weight and improve packaging, while still meeting power and performance benchmarks. Furthermore, their single-scroll design allows for more efficient collection of exhaust as it escapes from within the cylinders. To reduce the response delay that is associated with turbocharged powerplants, the rear Direct Drive Motor acts directly on the engine’s crankshaft and works in unison via a sophisticated algorithm to realize direct, high output, high torque acceleration performance. The enhanced efficiency of this design arrangement is particularly noticeable in normal everyday driving when accelerating from a low engine speed. Additionally, the rear electric motor also acts as a generator to provide supplemental power to the vehicles lithium ion battery pack, which also powers the front-mounted TMU. Other key engine design elements include a sand-cast engine block, lightweight and compact cylinder heads, FC thermal spray coating on the engine block cylinder sleeves (for higher thermal efficiency, weight and compactness) and a dry sump lubrication system that significantly reduces the engine’s center of gravity—allowing 61 mm reduction from the crank center to the engine bottom versus a conventional wet sump—while ensuring effective lubrication at high cornering speeds. The NSX has a compact valve train utilizing swing arm-type valve actuators, helping to reduce the inertial weight of the valve train and allowing a more compact head structure. The structure is similar to those found in some Honda racing engines. Intake and exhaust variable cam timing (VTC) is deployed to provide an excellent balance of high power, torque, fuel economy, and emissions. The new 9-speed dual clutch transmission works in concert with the engine and Direct Drive Motor to make full use of the power unit’s broad power band, producing lightning quick gear changes that support the NSX’s zero-delay response. As a key component of the Advanced Sports Package, the 9DCT has been optimized for compact size, low mass and low CG. The 9DCT has a very wide ratio range that allows for optimal gear selection in all driving conditions. First gear ratio is configured for maximum vehicle launch acceleration, while the close-ratio gears (2nd through 8th) are perfectly matched to make the most of the power unit’s power band. Conversely, high gear (9th) has been optimized for fuel efficiency during steady-state highway cruising. In efforts toward compactness and reduction of mass, the clutch and the differential are uniquely situated side-by side in a common housing. By adopting this design, overhang from the rear axle is minimized while the center of mass is moved forward. The exceptional direct and linear acceleration and dynamic response of the new NSX is enabled in part by its front-mounted Twin Motor Unit (TMU). It is a major driving force in creating the vehicle’s superlative zero-delay acceleration and can directly generate a yaw moment to support turning, and also recovers braking energy during deceleration. The TMU provides instant torque as well as AWD traction, allowing direct and stress free launches from start. In addition to improving 0-to-60 mph and quarter-mile times, this zero-delay acceleration response allows the driver to experience a heightened sense of G-loading that invigorates the senses, an adrenaline rush as accelerative forces push the body into the seat. Most importantly, the Sport Hybrid SH-AWD works in harmony with the poised chassis and brake system to provide intuitive brake pedal and steering feel so the driver always feels completely in control. The TMU is geared to support acceleration up to 200 kph, but continues to support Direct Yaw Control at all vehicle speeds. It is also a key enabling technology for driving in the Quiet mode setting of the IDS, allowing for hushed vehicle operation by operating the NSX as an electric vehicle. The IPU integrates the lithium-ion battery pack and a high-voltage distribution bus bar, with voltage distribution controlled by the PDU. The newly developed lithium-ion battery pack allows for increased energy density and improved electrical output when compared to similar systems in existing vehicle models. The Power Drive Unit (PDU) is centralized in a low position within the vehicle, hidden below the center console. The high-voltage lithium-ion battery is mounted within the Integrated Power Unit (IPU), which is in turn mounted behind the driver and passenger, forward of the firewall. To realize the New Sports eXperience and to support new concepts in vehicle dynamics—in particular the direct yaw control effected by the torque vectoring capabilities of the front-mounted TMU and the direct, zero-delay response of the chassis to driver inputs—the NSX engineering team was challenged to create a new concept for body design that delivered ultimate rigidity while minimizing weight and meeting other critical targets such as visibility, crash safety performance and durability/quality/reliability (DQR). The final result of this engineering challenge is the NSX multi-material space-frame which achieves structural rigidity far superior to its top-in-class competitors. More importantly, NSX drivers will feel their inputs directly translated to the car’s actions with zero delay, while simultaneously allowing the maximum potential of the Sport Hybrid SH-AWD system to be felt by the driver. The aluminum-intensive space frame utilizes extruded and cast parts to provide exceptional rigidity and light weight. In order to directly translate the direct yaw moment generated by the TMU, and to precisely deliver feedback to the driver with zero delay, individual aluminum castings have been utilized at each and every attachment point for the suspension. These castings are supported in all three dimensions (x, y, z) by optimized extrusions. Utilizing Global and local optimization routines, each casting and extrusion was analyzed for potential weight savings. The result is that most extrusions have custom wall thickness and many have a different wall thickness for each of their sides. Steel stampings have also been added to the architecture in certain areas where energy absorption is required, with supplemental aluminum stampings used where low weight is a key consideration. The front floor panels are constructed of carbon fiber core. One of the most difficult design challenges in the development of the all-new Acura NSX was to minimize the front and rear overhangs of the vehicle while managing energy absorption in key areas for crash safety performance and to maintain desired structural rigidity. To solve the issues of crashworthiness and occupant protection, a particular challenge in mid-engine vehicles, traditional aluminum castings were rejected due to their brittle characteristics. Instead, engineers have applied an innovative new technology called “ablation” casting, an all-new material application and a world first in the automobile industry. Jointly developed with Alotech, ablation casting technology is being utilized in the creation of six joining members, or nodes—two upper and two lower nodes in the front frame and two rear nodes. The front upper and rear nodes also serve as ultra-rigid suspension mounting points. The ablation casting process allows for the fine-tuning of both the cast part’s shape, as well as the material properties of the castings in the energy-absorbing areas of the vehicle, while minimizing weight in the form of a hollow part with optimized wall thickness. Unlike traditional castings, the high-strength and ductile properties of the aluminum ablation cast members allow these sections of the space-frame to progressively crush and are designed to withstand tremendous loads of up to 210 kN without breaking. For the A-pillars, new advancements in ultra-high-strength steel parts forming provided a perfect solution that met the engineering team’s goals for safety performance while maximizing forward visibility for the driver by reducing the A-pillar width. The original NSX was known for its outstanding forward visibility, giving drivers a feeling of being connected to the road, and this design attribute was considered essential to preserving a core characteristic of the NSX driving experience. The NSX A-pillars have been precisely crafted using an all-new, three-dimensional forming and tempering process that allows for a complex parts shape with ultra-high tensile strength of 1,500 megapascals. This “3D bent and quenched” component is heated and then robotically bent. During the bending process the part is cooled and tempered (quenched) using water jets. This process enables a very small section A-pillar with precise shape specification and tolerances, yet meets the increased structural rigidity for roof-crush performance requirements. The design and construction of the A-pillars in the new NSX represent the world’s first application of a three-dimensionally formed, ultra-high-strength steel system to be used in this manner within the automotive industry. When evaluating material composition and placement throughout the body, the design team determined that carbon fiber core would serve as the ideal material for the floor section forward of the seats. In addition to its light weight, this material is strong enough to handle the loads of driver and passenger placed upon it for vehicle ingress/egress. If aluminum had been used, the aluminum sheeting would have required additional cross-member frame support beneath it; this would have added additional weight. A number of innovative construction techniques are used in the manufacture and assembly of the all-new Acura NSX at the company’s new Performance Manufacturing Center in Marysville, Ohio. 100 percent of the aluminum space frame components are joined by Robotic Metal Inert Gas (MIG) welding, the first time to be applied in a mass-produced automobile on this scale. To aid the accuracy of the robotic weld process, the PMC utilizes an innovative rotating trunnion, or rotisserie-type, jig that rotates the part into the optimal position for the robotic weld arms, another first for automobile body construction. Exceptionally high-quality and precise space-frame construction is accomplished via this innovative methodology which combines highly precise robotic control of the weld process with the advanced skills of PMC weld technicians. A robust in-line quality confirmation process, for both the quality of the weld and conformity of part to established specs, involves confirmation by both robotic measuring equipment and by highly skilled weld technicians at every stage of the construction process. The NSX’s team of aerodynamicists utilized a new total airflow management approach to give the NSX the superlative airflow management one expects of a next-generation supercar, while simultaneously providing the effective and highly efficient thermal management required for its hybrid power unit. There are seven different heat sources in the hybrid-based powertrain—the 3.5-liter V6 engine, twin turbochargers, the 9-speed DCT, Dual Clutch system, Power Distribution Unit, Twin Motor Unit. To provide efficient cooling, airflow is managed through 10 different heat exchangers. Through the use of computational fluid dynamic (CFD) simulations as well as testing of 40-percent scale models in the company’s advanced wind tunnel facility in Ohio, the NSX development team fine-tuned the various body shapes, intake and exhaust vents and vehicle strakes to reduce aerodynamic drag, create downforce, maximize cooling and efficiently exhaust unwanted heat. The highly innovative total airflow management developments that were discovered and implemented into the new NSX by the Ohio team were later confirmed at the company’s full-scale/moving ground plane wind tunnel in Japan. Wheel wake management vents work in conjunction with fender vents to stabilize airflow down the side of the vehicle, allowing the air to enter the signature side intakes for efficient cooling. The air that enters the side intakes is distributed to three areas: engine intake, engine room cooling, and turbo intercoolers. Air flowing over the roof and down the rear hatch glass is captured to feed the transmission clutch cooler and introduce engine room cooling flow. A rear diffuser works together with the rear spoiler and taillight slots to generate significant downforce and effectively manage the air wake generated behind the vehicle. To develop an interior with exemplary ergonomics in terms of comfort and functionality, the Acura design team utilized a number of test drivers with wide-ranging driving backgrounds—from “regular” people to professional race drivers.—in order to gather information to improve all aspects of driver feel and comfort in the NSX. Materials such as leather and Alcantara were carefully selected for the perfect combination of luxury comfort and dynamic driving support (such as lateral grip). Likewise, the center console/controls—designated as the Simple Sports Interface—have been designed to minimize the potential for distractions from the most important function—driving. Stylish as well as structurally rigid and lightweight, the seats in the new NSX have been designed to offer superlative comfort and support. Alcantara is placed in the center section of the seat to increase lateral grip, while smoother leather is applied on the bolsters to allow freedom of torso rotation during cornering as well as easy of ingress and egress. Developed through extensive testing and pressure mapping measurements, these seats more in conjunction with the padded center console and door panel to provide whole body support during high G cornering. The all-new 2017 Acura NSX chassis carries forward the tradition of sophisticated engineering and advanced design while taking on-rails handling performance, combined with sophisticated ride quality and refinement to an all-new level in the supercar class. Athletic performance is assured through the Advanced Sport Package, a design and packaging concept that sees major components including the powertrain, fuel tank and lithium-ion battery pack optimized for compactness as well as outstanding weight distribution and an extremely low center of gravity (CG). The platform of the NSX not only possesses the highest degree of structural rigidity ever engineered into an Acura vehicle, it also achieves the lowest levels of noise, vibration and harshness (NVH) of any competitive vehicle. The highly rigid platform structure, advanced front and rear suspension with Magnetic Ride (MR) dampers, finely-tuned variable gear ratio electric power steering and next-generation Super Sports Brake Concept featuring Brembo performance brakes and regenerative braking capability inspire absolute driving confidence—whether taking a sweeping turn at high speed on the race track, negotiating a multitude of tight corners on a winding mountain road or taking an extended trip out on the open highway. With the newly designed twin-turbocharged 3.5-liter V6 engine, special consideration was given to how the engine would be secured to the chassis in order to achieve the highest structural rigidity while producing the lowest levels of noise, vibration and harshness (NVH). The solution was to create an engine cradle system that combines hydro-engine mounts with a rigid aluminum sub-frame plate that simultaneously supports the engine while acting as a vibration and noise inhibitor. Engine mounts are ideally located to minimize pitch and roll movement of the powertrain mass. Testing and analysis demonstrated that this novel configuration provides notably improved vehicle handling performance while exceeding targeted NVH levels. The NSX’s all-aluminum, fully independent front and rear suspension system, equipped at all four corners with third-generation active magnetorheological (MR) dampers, is optimized for high-strength, low unspring weight, and supercar response while maintaining a high degree of comfort and ride compliance. The all-aluminum front suspension has been optimized with compact and lightweight components and suspension geometry developed for superior handling performance, crisp and communicative on-center steering feel, and excellent stability. Featuring lightweight all-aluminum components, the rear suspension employs a sophisticated independent multi-link design. A key design feature to help improve driver feel through the Electric Power Steering (EPS) system was the addition of dual ball joints for the front suspension lower arms, providing for substantially better “oneness with the road,” according to Dundon. The NSX makes use of a dual-pinion (with rack-mounted assist motor) electric power steering (EPS) system with a variable gear ratio. When on center, the ratio remains constant and is tuned for optimal high speed control and stability. Off center, the gear ratio becomes quicker for improved turn-in and maneuverability at low and mid speeds. This also minimizes the need for hand-over-hand motion to help drivers keep their hands on the steering wheel. Furthermore, this sophisticated steering system links the vehicle stability assist (VSA) and EPS to help detect handling instability on slippery roads and under braking for greater vehicle control and an increased safety margin when driving in adverse conditions. Seamlessly integrating both mechanical (friction) and electric-servo (regenerative) brake systems, the NSX provides exceptionally precise, linear and fade-free brake performance in almost any driving condition. The Brembo braking system consists of large six-piston aluminum monoblock calipers with two-piece 14.5-inch ventilated rotors up front. The rear uses four-piston aluminum monoblock calipers and 14.0 inch ventilated rotors. A two-piece brake rotor eliminate rotor distortion at high heat allowing for consistent pad to rotor contact and improved heat dissipation. Themonoblock brake calipers have been designed with high rigidity to provide even pressure distribution. Ultra high-performance carbon ceramic brake rotors are available as a factory-installed option. Excellent brake cooling at both front and rear has been achieved as an integral part of the total airflow management package. Extensive research and development work has been done to maximize the cooling efficiency and performance of the rear brake system. Typically, effective brake cooling at the rear of a mid-engine vehicle is difficult due to component packaging and proximity of the engine and transmission. NSX engineers devised a clever solution by creating openings beneath the vehicle and utilizing portions of the hollow rear sub-frame as ducts to force feed air to the rear brakes. 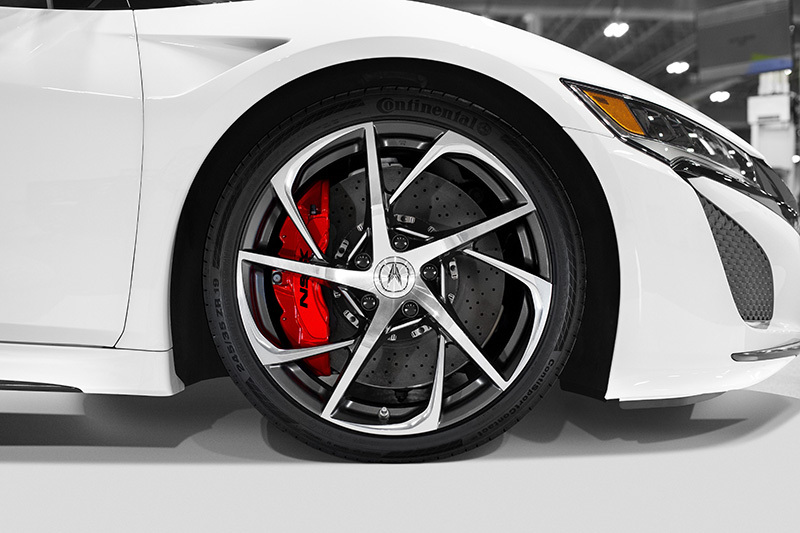 The standard wheel design package for the new NSX includes lightweight alloy wheels with “Y”-style spokes wrapped in Continental Conti-Sport Contact 5P tires (245/35ZR19 front; 305/30ZR20 rear) developed jointly with Continental. The unique “Y-wheel” design is a result of the NSX engineering team’s extensive research to find the strongest spoke structure while using the least amount of material in order to save unspring weight. Forged in high-strength aluminum, the result is a weight savings of nearly 7 pounds per set and lower total weight than any wheels of similar size and material composition within the NSX’s segment. Additional wheel/tire options, including a track-focused tire, will be available. Finding the ideal weight distribution, center of gravity, shape and placement of the fuel tank was a difficult design task, especially when taking into consideration protection in the event of a rear-end collision. The solution was a design that uses twin tanks composed of a specialized resin material that allowed for tremendous flexibility in the freedom of the shape of the fuel tanks for optimal packaging and enhanced safety. The tanks are centrally located between the engine and the IPU. The NSX Integrated Dynamics System (IDS) provides the driver with four selectable dynamic modes—Quiet, Sport, Sport+ and Track. The system integrates all of the vehicle’s dynamic chassis and powertrain systems—steering, brakes (mechanical and electro-servo), throttle, vehicle stability assist, magnetorheological dampers, engine, transmission, and Sport Hybrid SH-AWD control systems. From the available all-electric operation of Quiet mode to the closed circuit, maximum performance capacities of Track mode, IDS progressively dials up the dynamic characteristics of the vehicle based on the needs of the driver and the driving environment. In addition to these dynamic system variations, IDS varies cabin sounds via Active Exhaust Valve (AEV) and new Intake Sound Control (ISC). ISC uses twin pipes with an electrically controlled valve to vary the sound being transmitted from engine air intake system to twin outlets in the rear uppermost portions of the cabin. Utilizing these technologies, IDS is able to fine-tune cabin sound quality and volume to match the dynamic character of the vehicle in Quiet, Sport, Sport+ and Track modes. Of note, there is a full 25 dB volumetric sound difference between Quiet and Track modes—a tremendous variance in audible sensation. Quiet mode prioritizes electric-only driving at lower speeds, maximizing energy efficiency and minimizing cabin sound. The vehicle uses the TMU for initial launch from a standstill. When power demand requires the engine, it starts more quietly than in other modes and maximum engine speed is limited to 4,000 rpm, while the Active Exhaust and Intake Sound Control valves are closed for a more hushed operation. The transmission shift map also prioritizes lower engine speeds. The Driver Interface (tachometer and center console information display screen) features a cool and quiet blue color. Sport mode takes advantage of the Sport Hybrid system to offer the driver a direct responsive vehicle or a more relaxed vehicle according to their driving inputs. Compared to Quiet Mode, it eliminates the 4,000 rpm limit on the engine and provides a more aggressive throttle map for quicker response. A more aggressive transmission shift map holds gears longer and allows higher rpm shift points. The Intake Sound Control system and the Active Exhaust Valve are activated, allowing exhaust and intake sound to permeate the cabin for a more emotional driving experience. Like the Quiet mode, sport mode provides idle stop function. The Sport setting is the default setting in normal vehicle operation. Sport+ prioritizes maximum drivetrain response and dynamic performance with faster up- and down-shifts of the 9 DCT and still more aggressive throttle mapping. Maximum use of the electric motor torque provides more explosive acceleration. Increased agility is achieved by harmonizing a more aggressive Direct Yaw Control setting that works in concert with the magnetorheological dampers, Agile Handling Assist, and the Electric Power Steering System—perfect for a spirited drive on a winding road. It also offers the driver a higher degree of steering feedback, while intake and exhaust note sounds via Active Sound Control are further increased for an even more exhilarating and emotional driving experience. The TFT Meter sports an aggressive yellow “con-trail” along the tachometer needle supporting easy recognition of engine RPM. Red highlights for the center console information display also reinforce that the driver is in now in Sport+ mode. Optimized for circuit driving, Track mode invokes the most aggressive settings and parameters to deliver the fastest and most consistent lap times possible, along with maximum acceleration from a standstill when utilizing launch control mode). The braking system offers enhanced performance-oriented pedal feel. Up/down gearshift execution of the DCT and performance of the Super Hybrid SH-AWD and active driver aids (VSA, AHA) are programmed to support circuit limit driving, and an even greater amount of engine intake sound permeates the cabin for a more heightened and emotional driving experience offering enahanced driver feedback even when wearing a helmet. This setting also prioritizes the lithium-ion battery state-of-charge to maintain a consistent level of torque delivery and direct yaw moment from the three electric motors to ensure consistent dynamic response and lap times. Of note, the VSA operation is progressively “loosened” from the IDS Quiet mode up to Track mode, enabling a progressively higher degree of freedom for the driver in exploring the dynamic capabilities of the NSX. In “Track” mode, the VSA system can also be completely disabled by the driver. The NSX IDS system has the world’s first custom setting menu that allows the driver to configure the vehicle’s mode during startup. For example, drivers can program the car to always start in Quiet or Sport mode, along with the ability to schedule the NSX to operate exclusively in Quiet mode during any specified time period such as the early morning to avoid waking the neighborhood. 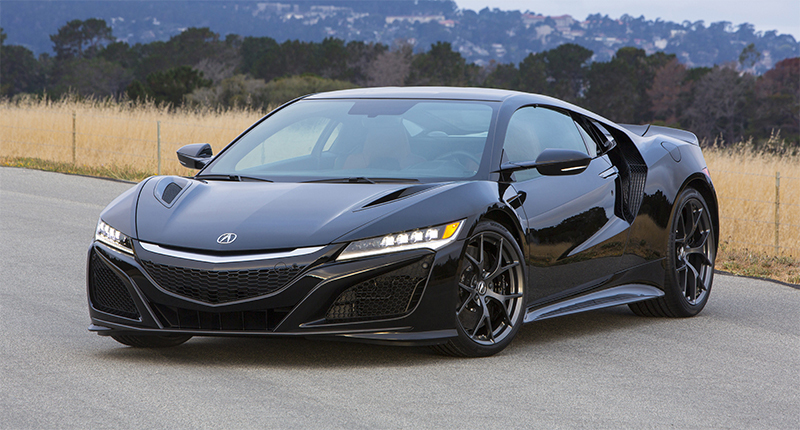 By combining timeless NSX values and advanced technologies to create zero delay performance in all aspects of the vehicle, the next generation 2017 Acura NSX represents a completely new and uniquely Acura expression of what a supercar should be—with superior ergonomics, groundbreaking design and supercar thrills every day without compromise. In challenging to create a New Sports eXperience the next generation NSX will provide an intense and personal connection between the driver and machine that establishes a new and paradigm-challenging definition of supercar performance. Bore and Stroke 3.6 in. x 3.5 in. Track (front/rear) 65.2 in. / 63.7 in. Ground Clearance (unladen) 3.7 in. Curb Weight (without options) 3,803 lbs.